Like many wartime leaders, President Woodrow Wilson used propaganda to encourage nationalism and patriotism among Americans. The portrayal of America as the potential savior of the Allied powers in Europe influenced American attitudes about the sacrifices required to win the war. The American government delivered many of these messages through the effective use of mass media. What role does propaganda play in a time of war? What type of messages are being portrayed in words and/or pictures? How do you think each segment of the population (e.g. immigrants, German-American citizens, other foreign-born American citizens, labor leaders, pacifists, and Socialists) might have received and interpreted these advertisements and appeals? What do all of these propaganda materials have in common? 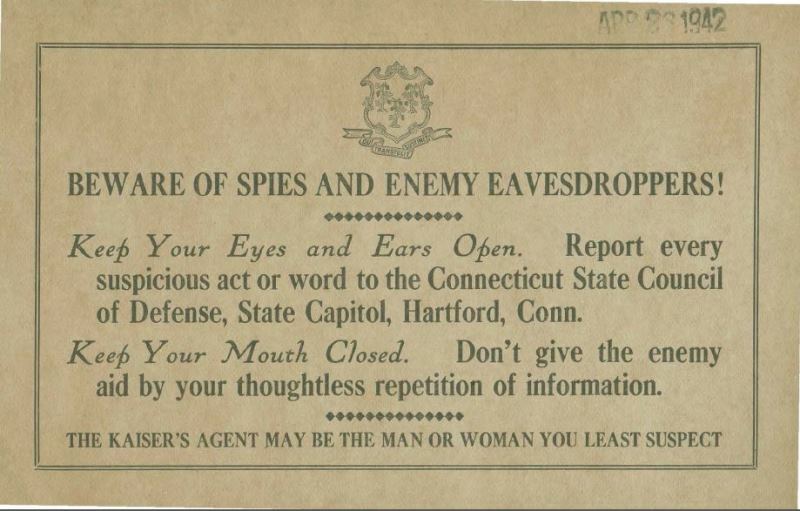 Beware of Spies and Enemy Eavesdroppers!, Connecticut State Council of Defense, ca. 1914-1918. Connecticut State Library. 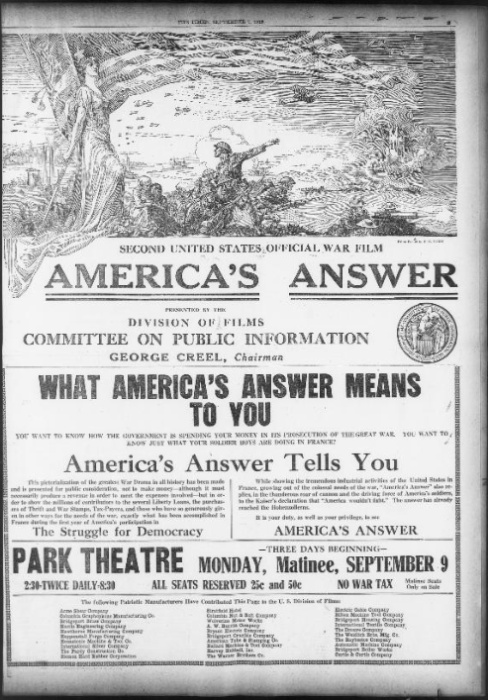 Second United States Official War Film, “America’s Answer,” Presented by the Division of Films Committee on Public Information, George Creel, Chairman. A full page advertisement in the Bridgeport Times and Evening Farmer, September, 7, 1918. Library of Congress, Chronicling America: Historic American Newspapers. 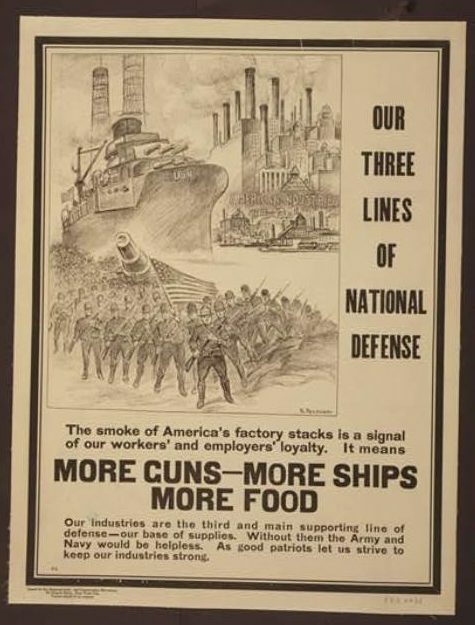 R. Peckner, Our Three Lines of National Defense, poster by the National Industrial Conservation Movement, 1917. Library of Congress, Prints and Photographs Division. We closed the road to Paris – we’re on our way to Berlin. 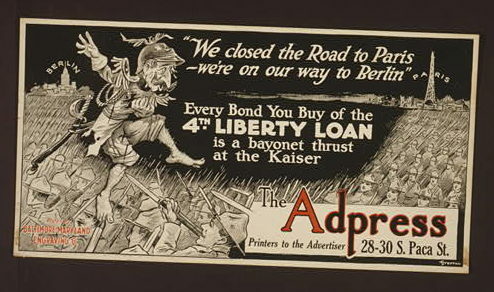 Every bond you buy of the 4th Liberty Loan is a bayonet thrust at the Kaiser, poster by AdPress, 1917. Library of Congress, Prints and Photographs Division. “To Arms! Enlistment Week! Connecticut’s Call to Her Sons! Native Born or Adopted!” A full page advertisement in the Norwich Bulletin, June 27, 1917. 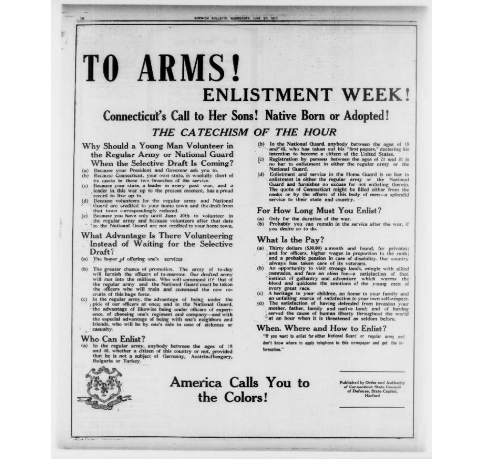 Library of Congress, Chronicling America: Historic American Newspapers. Students will read and reflect on the propaganda materials and discuss the supporting questions in pairs or groups. Students will use a KWL chart or Library of Congress Primary Source Analysis Tool to organize their work. Groups will share their materials and findings with the rest of the class, discuss the supporting and compelling questions, and then develop additional questions of their own. This letter may express concern or support, based on the students’ interpretation of the propaganda images. Students may include evidence from readings and reference other sources they have investigated. Students will then select a different group that might have had a different view on American entry into the war and write a second letter to President Woodrow Wilson from this perspective. Working in pairs or groups, students will present their letters for discussion and reflection. Wells, Robert A. “Propaganda at Home (USA).” International Encyclopedia of the First World War, ed. by Ute Daniel, Peter Gatrell, Oliver Janz, Heather Jones, Jennifer Keene, Alan Kramer, and Bill Nasson, issued by Freie Universität Berlin, Berlin, 2014. How We Advertised America: The First Telling of the Amazing Story of the Committee on Public Information That Carried the Gospel of Americanism to Every Corner of the Globe by George Creel. New York: Harper & Brothers, 1920. Over Here: The First World War and American Society by David M. Kennedy. New York: Oxford University Press, 2004. America’s Great War: World War I and the American Experience by Robert H. Zieger . Lanham, MD: Rowman & Littlefield, 2000.